Home > large format	> What Does Your Front Store Sign Say About Your Business? What Does Your Front Store Sign Say About Your Business? Do you run a business or own a store? Not only is advertising your business important but what is of outmost importance is the first impression that your potential customers or customers get the minute that they step into your store or place of business. Front of Stores usually set the tone of that first impression. 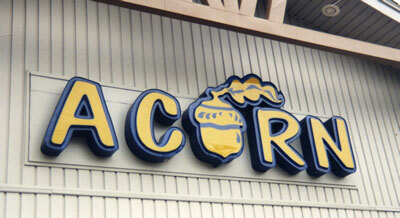 You should ask yourself what image it is that you really want your front store sign to portray about your company. First impressions are everything so you definitely want to make a good one! The idea is to have an extremely unique sign that describes your business and really catches the attention of everyone who sees it. Using bright colors and a symbol of what you do is really helpful. Let’s say you own a dog grooming salon, you would want to have a sign that has something to do with grooming. This could be achieved by using a sign that has a logo with a dog getting a haircut along with your company’s name. People will see your front store sign as they drive by your business and if your sign is unique and eye catching, people will remember your sign therefore remembering the company’s logo and name. Let’s say someone is driving home and they see your sign, they’ll instantly realize that you groom dogs. Well what happens if they get home and realize that their dog really needs a haircut? They’ll remember you front store sign and perhaps even do business with your company! This is why using signs can be very effective! A picture is worth a thousand words and therefore can either make or break your company! We want to MAKE your company! Here at Top Class Marketing & Designs we offer a wide variety of front store signs! Tell us what you want and we’ll make it happen! Choose Quality, Choose Class! Choose Silk Laminated Business Cards! Love Your Environment? Go Green! Print Green!